Thom Browne says it was humbling to have first lady Michelle Obama wear an outfit he designed during Monday's inauguration festivities. Mrs. Obama wore a navy-silk, checkered-pattered coat and dress by Browne that were inspired by a menswear necktie. The outfit was specifically designed for the first lady, but Browne said he wasn't 100 percent sure she was going to wear it until she came out with it on Inauguration Day. "I am proud and humbled," he told The Associated Press. In a phone interview with the Los Angeles Times, Browne added, "It's one of those humbling experiences in life. With all the American designers she could have chosen from, the fact that she chose mine was overwhelming and one of those experiences that you can never really put into words other than just [to say] 'truly humbling' and I'm so proud that she chose it -- and I'm also so proud that she looked so good in it." He also told The New York Times: "It's overwhelming. It is one of those rare moments in someone's career that you will always remember. There's not a word that can really describe it. It's just amazing." 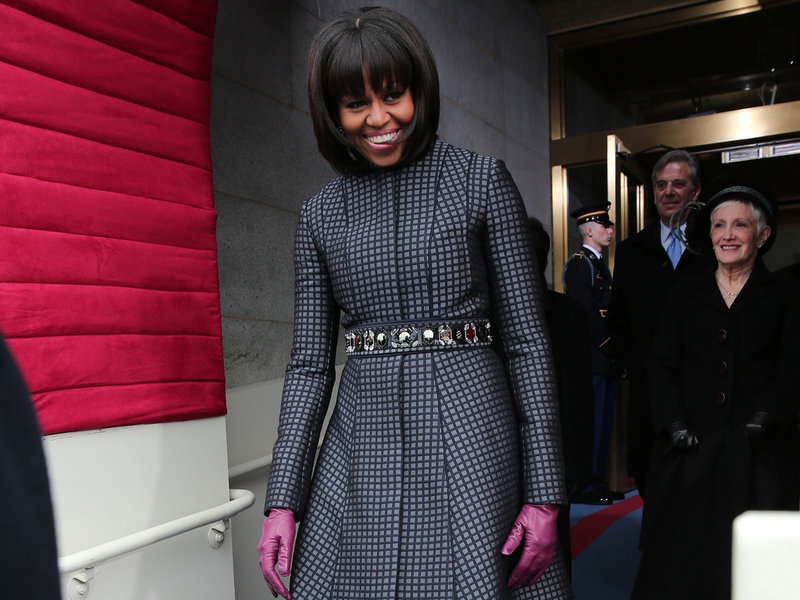 The rest of Mrs. Obama's Inauguration Day outfit included a belt and shoes from J. Crew, necklace by Cathy Waterman and a cardigan by Reed Krakoff, whose ensemble she also wore to Sunday's intimate, indoor swearing-in ceremony. Mrs. Obama later swapped her shoes for Reed Krakoff boots, and added J. Crew gloves to the ensemble. The first lady has worn Browne's designs for other occasions, including a gray dress with black lace overlay to one of the presidential debates last fall, and she honored him last summer at the Smithsonian's Cooper-Hewitt National Design Awards for his contribution to fashion. Browne made his name in modern -- very modern -- menswear, but he launched womenswear in 2011. He was in Paris on Monday, just finishing previews for his next menswear collection. The idea to use the tie fabric came to him because he was indeed designing these men's clothes at the same time, he explained. "I wanted 'tailored' for her. For me, she stands for strength and confidence, and that's what I wanted to design for her," he told the AP. Browne also noted that the first lady "is so supportive of so many American designers."